On August 28, 2013, a three-judge panel of the ICTY voted to remove Judge Frederik Harhoff from the case against Vojislav Seselj. The defendant had filed a motion to remove Harhoff on grounds of bias or perceived bias, stemming from a letter that Harhoff circulated via email to 56 contacts. The panel, in a 2-1 vote, agreed that Harhoff had to go. Most of you know the background to this story, but I'll repeat it for those who haven't heard it. Harhoff's letter, which quickly leaked to the public, complained about recent decisions at the ICTY that have changed the requirements for prosecution under aiding and abetting. These ICTY trial and appeals judgements resulted in acquittals in the cases of Prosecutor v. Perisic, and also more recently in Prosecutor v. Stanisic and Simatovic. These acquittals were highly controversial and sparked intense discussions in both the legal community (over the correct requirements for aiding and abetting) and the popular press (about why the tribunal was acquitting Serbian government officials who assisted Bosnian Serb forces committing atrocities). Harhoff's letter contained at least two criticisms. First, he suggested that these cases were wrongly decided. Several legal scholars have also complained bitterly about these cases. The Appeals Chamber rationale for the decisions was that Serbian government officials could only be convicted if their assistance was specifically directed to the atrocities and illegal activities committed by the Bosnian Serb forces, who were also involved in the "lawful" activity of regular armed conflict. The defendants in these cases argued that they had the right to logistically support the Bosnian Serbian war effort (or at the very least that such support was not criminal) and that they shouldn't be blamed for the fact that the Bosnian Serb forces violated the rules of war by committing illegal atrocities against civilians. So the Appeals Chamber concluded that a conviction was only appropriate in these "distant" support cases if the defendant specifically directed the assistance to the illegal activities as opposed to the regular war-fighting of the troops. Second, Harhoff made the explosive and controversial allegation that the President of the ICTY, Judge Meron, had buckled to American and Israeli pressure to change the legal standards regarding aiding and abetting. The implication here is that American and Israeli governments often send cash or weapons (either covertly or explicitly) to foreign fighters, and American and Israeli officials were worried that international legal standards might generate criminal liability for them if the foreign fighters ended up committing atrocities. "Right up until autumn 2012, it has been a more or less set practice at the court that military commanders were held responsible for war crimes that their subordinates committed during the war in the former Yugoslavia from 1992-95, when the Daytona Agreement brought an end to the war in December 1995." The key phrase here is "set practice." According to two judges on the panel (the third, Judge Liu, dissented from the decision), this phrase indicated bias because it did not include "reference to an evaluation of the evidence in each individual case." In other words, the panel concluded that Harhoff was either biased or appeared so because he was suggesting that military commanders should be convicted as a matter of course, regardless of the evidence. "The responsibility then was either normal criminal responsibility as either (1) contributing to or (2) responsibility for the top officers with command responsibilities in a military system of command authority where these failed to prevent the crime or punish the subordinates.There is nothing new in this. We had also developed an extended criminal responsibility for people (ministers, politicians, military leaders, officers and others), who had supported an overall goal to eradicate ethnic groups from certain areas through criminal violence, and which in one way or another contributed to the achievement of such a goal; it is this responsibility that goes by the name of 'joint criminal enterprise'." This section makes clear that Harhoff was not suggesting that all commanders should be convicted. That's a very weak interpretation of the letter. Rather, what Harhoff was saying is that the tribunal had a set of legal standards, expressed in the second of the two paragraphs that I quote above, and that these legal standards were upset by the Perisic and Stanisic and Simatovic line of cases. This, of course, is an entirely plausible legal analysis. Perisic and Stanisic and Simatovic applied the specific direction standard, which in some previous cases had not been applied (or at least not in the same way), and this represented a jurisprudential development that some have agreed with and others have not. Of course, reasonable people can disagree over whether the specific direction requirement is correct. We can also disagree over whether it is part of the mens rea or actus reus of the legal standard (the Appeals chamber considers it part of the actus reus even though it sounds like a mental element according with "purpose"). We can also disagree over whether the specific direction requirement applied in the Perisic and Stanisic and Simatovic cases is more consistent with the standard originally stated in the old Tadic opinion (where the phrase specific direction was first mentioned in dicta). 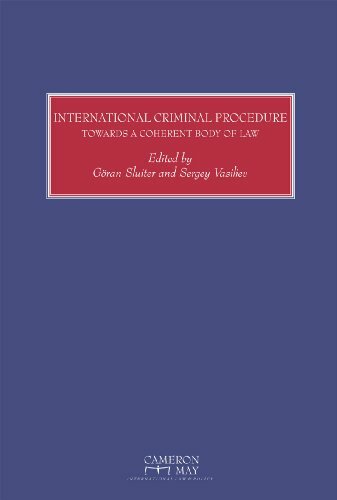 However, I think it is relatively uncontroversial to note that the these cases upset the jurisprudence of the ICTY on aiding and abetting. That's what made these cases such a subject of intense debate in legal circles. That's what Harhoff meant when he said that there was, until these recent cases, a set practice regarding assistance. The jurisprudence was one way, now it has been changed, and he doesn't like it. And he said so. That doesn't demonstrate bias against a defendant, it just demonstrates his disagreement with President Meron on a matter of legal substance. There are plenty of other aspects of Harhoff's letter that I am not willing to defend. It was ill advised to write a casual letter to a large group of individuals; he should have written a law review article argued with precision and clarity. He cobbled together the mental elements of aiding and abetting, JCE, and command responsibility, without making clear that his chief complaint was newly inconsistent mens rea requirements across different modes of liability. His suggestion that President Meron bowed to political pressure strikes me as both scandalous and unlikely. First, American government officials just don't pay that much attention to ICTY jurisprudential developments. Second, there are plenty of other governments that are more likely to be concerned about this issue, especially in Europe, where French and Italian governments sometimes support rebel forces that might commit war crimes (e.g. Libya). So the idea that this is an American or Israeli "problem" strikes me as unlikely. Also, I'm not willing to take a stand one way or the other about the correctness of the specific direction requirement; I'm still trying to decide which view of the law is correct based on the on-going legal debates. (See James Stewart here and here; Kevin Heller here and here). All very stimulating. However, I just don't see evidence of bias or perceived bias here. What I see is a judge with a deep disagreement over the jurisprudence in recent cases -- a disagreement that plenty of others have voiced. And there's nothing biased about a judge who makes their view of the law known in advance -- if that were prima facie evidence of bias, then every judge at the ICTY would be guilty of bias by virtue of having written law review articles, or even participated in previous cases where these legal issues were decided or applied. If this were the standard, only new judges with no history of judging past cases, could sit on trials. Writing in the most recent issue of the Weekly Standard, Edwin Williamson and Hays Parks ask: what ever happened to the Department of Defense Law of War Manual? As many of you know, Hays Parks is widely considered to be one of the leading U.S. voices in the Law of War, and he was the moving force behind the Pentagon's creation of a consolidated Law of War Manual for the entire Defense Department. Although each of the individual service branches has published manuals and handbooks in the past, the goal was to create an updated and consolidated statement of the law of war, which would be authoritative across the Department of Defense. The project was largely complete when Hays Park retired from the Pentagon, but then the manual was never published. Many have wondered, what ever happened to it? Now, Williamson and Parks explain why. They complain that the process was hijacked at the last minute, with officials from the State Department and the Justice Department holding up the process with ideologically driven objections to specific statements in the manual. Williamson and Parks are particularly annoyed by this late delay, because they say that the inter-department working group process that created the Manual already included feedback from these departments. The objections showed up at the very last minute, and aren't even legally supportable objections. Williamson and Parks think they are more political than anything else. They point to two major objections, but of which involve legal issues discussed on this blog before. First, they assert that some State Department officials -- Parks and Williamson also refer to human rights activists as a possible source -- object to the use of the phrase lex specialis in the Law of War Manual. This is a technical Latin term, but these two words signal a huge foundational debate in public international law right now. The draft Law of War Manual states that the law of war is lex specialis, meaning that it provides a special body of law that applies during situations of armed conflict. Although there are different interpretations of what this phrase means, one version enails that these special rules "knock out" the more general rules, say of human rights law, that apply during peacetime. Another version of the lex specialis argument entails that human rights are universal, but the content of human rights law is provided by the codified and customary rules of warfare embodied in the laws of war. Simply put, the law of war just is "human rights law during armed conflict." Either way, both versions of the doctrine suggest caution before importing specific rules of human rights law into the domain of armed conflict. According to some legal scholars, such importation runs the risk of upsetting the meaning and content of the already existing norms in the law of war. Whether the State Department has really objected to this phrase, I have no idea. But Parks and Williamson are surely correct that this is no mere philosophical debate. It has practical consequences -- and one of them involves the capture-vs-kill debate. As I have argued in several essays and law review articles, the military concept of necessity allows the government to kill any legitimate target during armed conflict, regardless of whether capture is feasible. (Of course, if the target has successfully communicated his surrender then he is hors de combat and not a legitimate target). In other words, there is no generalized duty to capture in the law of war. However, the concept of necessity works differently in human rights law, and means engaging in the least restrictive means to achieve the particular result. That would mean attempting capture prior to killing as a last resort. According to Parks and Williamson, several human rights-oriented officials in the State Department object to the description of the law of war as lex specialis, and would rather promote the importation of human rights norms into situations of armed conflict. If this report is true, one wonders what these officials think of the U.S. targeted killing program. There was a second problem, according to Parks and Williamson, although this one comes from the other side of the ideological spectrum. Allegedly, officials from the Justice Department objected to the draft manual's conclusion that civilians taking part in hostilities are not automatically guilty of war crimes. Again, this sounds technical, but it is of immense importance. Consider a civilian who is participating in an armed conflict and doesn't have the privilege of combatancy (because he refuses to wear a uniform or display his weapon openly). If he kills an enemy soldier, can he kill be convicted of a war crime? If yes, which one? 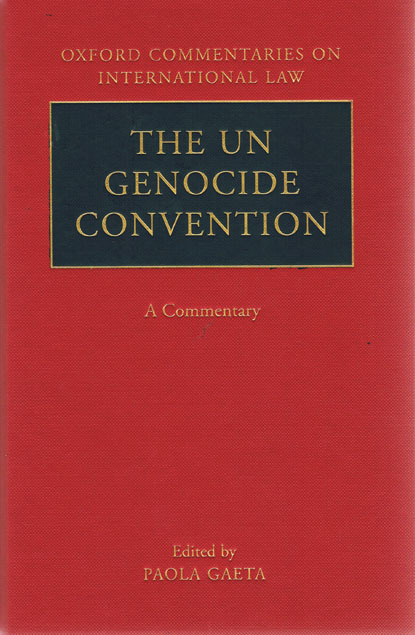 At some points in the past, the U.S. has argued that such individuals are guilty of "murder in violation of the law of nations" -- even though that phrase appears nowhere in the major conventions on war crimes (Geneva, Rome, etc.). The correct view, of course, is that this isn't a war crime at all, although it may constitute a violation of domestic criminal law (since there is no combatant immunity for the killing). But if it isn't a war crime, then it can't be prosecuted before a military commission (arguably), which should be limited to international law of war offenses. So one could see why the Justice Department would be sensitive to this issue, since it has implications for cases at the military commissions. But this legal theory was mostly associated with the Bush Administration, and it was thought that the Obama Justice Department had abandoned it. In any event, a letter from the General Counsel of the Department of Defense claims that the statements attributed to the Department of Justice simply aren't true. The DoD General Counsel letter also claims that the final manual will be forthcoming, but does not give a precise date. Why Did the ICTY Acquit Stanisic and Simatovic? Yesterday an ICTY Trial Chamber issued acquittals on all charges against Stanisic and Simatovic and ordered their release from the UN detention facility. Stanisic and Simatovic were government officials in Serbia accused, inter alia, of aiding and abetting crimes committed by Bosnian Serb forces operating in Bosnia. Amongst other allegations, the prosecution alleged that the officials provided assistance to paramilitary organizations, such as Arkan’s Tigers, that perpetrated war crimes and crimes against humanity against civilian populations. There are several reasons for this result. But in a sense, the result is not surprising at all because the writing was on the wall after Perisic was acquitted in a very similar case a few months ago. 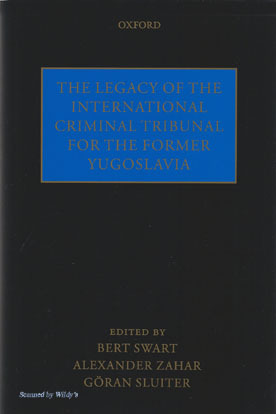 In Perisic, the ICTY advanced a relatively novel theory regarding defendants accused of aiding and betting organizations that perpetrate international crimes. The tribunal concluded that in cases where the organization is engaged in a mix of lawful and unlawful activities, the prosecution must prove that the defendant “specifically directed” his assistance to the criminal behavior, as opposed to the lawful activities of the organization. Strangely, though, the tribunal concluded that the “specifically directed” requirement was not a mens rea requirement (something that would have been similar to the “purpose” requirement for aiding and abetting that criminal law students know well) but rather an actus reus requirement. In short, the prosecution had better draw a straight line from the defendant’s conduct to the criminal behavior, rather than rest on a circumstantial case of general assistance to an organization that then engages in criminal behavior, even if the defendant has the intent to facilitate the criminal conduct. In the case of Serbia, the “specifically directed” requirement is probably designed to resolve the Serbian defense that its officials were merely supporting a war effort among ethnic Serbs in Bosnia, and that the Serbian officials had no involvement in the atrocities committed by ethnic Serbs in Bosnia. In order to make this common sense argument work, however, you need to add another piece of the puzzle. Why wasn’t the war effort itself illegal? For some observers, the Serbian state was engaged in naked aggression, either directly or via proxies in Bosnia that violated basic principles of international law. Putting aside for a moment whether this claim is factually accurate or not, its substance simply does not fall within the jurisdiction of the ICTY, which has no authority to engage broader issues of jus ad bellum. 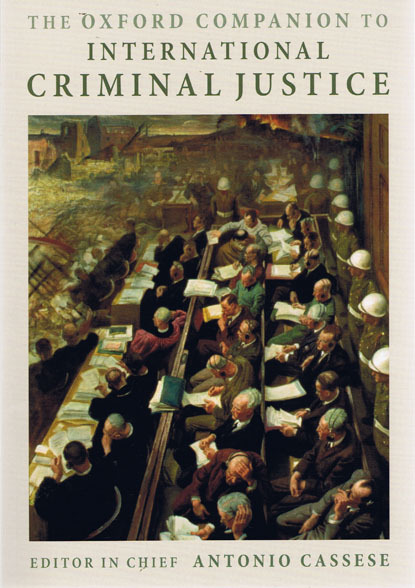 Indeed, the result in both Perisic and Stanisic and Simatovic can be traced back to the conscious decision after Nuremberg to turn away from questions of jus ad bellum (aggression, crimes against peace, etc.) and focus exclusively on jus in bello violations and crimes against humanity. Consequently the ICTY has no jurisdiction over aggression and the ICC’s jurisdiction over aggression (post-Kampala) is best described as hypothetical, not actual. This has real consequences when a defendant can fall back on the argument that it was assisting a “lawful” war effort and had no intention to provide assistance to the jus in bello violations that were merely the means to achieving that war effort. There is a second issue here and it is one that the ICTY has not sufficiently addressed. How does complicity work in the organizational context? If an organization engages in a mix of illegal and “legal” activities, when does assistance to that organization trigger liability? Such questions do not often arise in domestic criminal law, since criminal organizations (like the Mafia) are usually understood to be criminal through and through. Since they do not have a legitimate purpose, the Perisic issue does not arise. I have been searching for a good comparison in another area of domestic law where the mixed nature of an organization is relevant in this way. I haven’t found one yet. As a final point, I take no position on the factual findings reached by the ICTY Trial Chamber. Could they have found Stanisic and Simatovic guilty even under the new standard of “specifically directed”? Indeed, isn’t there an argument here that the whole point of funding covert paramilitary units, such as Arkan’s Tigers, whose fighters were paid with per diem dispersements that came directly from Belgrade, is to facilitate ethnic cleansing of the disputed territory by conducting a reign of terror against the civilian population? If the point was simply to support a lawful military operation, why not just send the regular Serbian Army? There might be inferences to be drawn here, but apparently the ICTY Trial Chamber was unwilling to make them or felt they were not warranted based on the trial record. I will leave an assessment of that decision to the Appeals Chamber.